Elysian Gates are six musicians from Luxembourg who got together in 2010. Unlike many other bands, they didn’t try to release a record right away, which may be possibly because it takes longer to write a symphonic prog rock song than a mere three chord punk track. The long wait is finally over in 2013 with the band’s debut album Destination Unknown. 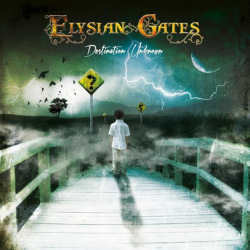 The band quotes Dream Theater, Symphony X and Nightwish as their major influences, and this is already quite a good description of what to expect from Elysian Gates. It has to be said though that they don’t quite reach yet the playing level of the aforementioned bands, and next to quite a lot of sunshine, there are still shady places to be made out. The three minute instrumental intro for instance seems overly long, and the following Desert Land is a rather gloomy piece that doesn’t work too well as an opener. Things improve with Nightingale, an upbeat example of symphonic metal with neo prog flair. Over the course of the album, it becomes clear that these kinds of songs are those that work best for the band. The Demons In My Head is a wonderfully lively track full of mood changes. Here the band is acting at times playful, then darker, and even finds room for quieter moments, without ever straining the envelope. Nightmare and the fourteen minute epic track Seven Angels furthermore underline these qualities. But to be fair, let’s also have a look at the lesser material. Desperate sounds like an unspectacular attempt at a Dream Theater ballad. Childhood’s End feels like kitsch and doesn’t have the necessary impact. Colpi d’Amor with its operatic vocals are also not exactly to my taste but fortunately has been placed at the very end of the CD. Elysian Gates certainly have a lot of interesting ideas, but too often they lack a healthy dose of heaviness that would give their music more substance. Maybe they should put more weight on the guitars and less on the keyboards in the future.